Bins are a necessity in an educational setting, as they can be used to teach children about the importance of recycling and clearing up after themselves, as well as a method to keep the premises litter free. The lunar 95 litre bins from Slingsby are an excellent addition to school premises, in vibrant colours and interesting designs. 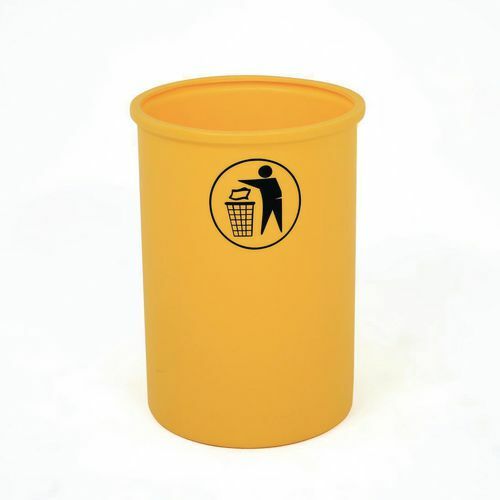 They have an open top design, making it easy for users to deposit debris into the bins and they are manufactured from strong polyethylene, ensuring that they are durable products. These bins can be used both indoors and outdoors and they have a capacity of 95 litres, making them ideal to place in areas where there it is likely there will be a large amount of waste. They are available in four colours; green, light blue, red or yellow and there are two designs; a smiley face logo, which would be best suited to primary/infant schools or a tidy man logo, which is ideal for middle/high schools. Our lunar 95 litre bins are a great addition to any education environment, offering an easy place for students to throw away their rubbish and they come with FREE UK Delivery.